Commercial broker Robert Hand, president of Louisiana Commercial Realty, said that he feels either project would do extremely well in that area due to high demand for those services. Feil purchased the 1.6-acre site from the family that owns Dixie Beer for $5.6 million in April. He also bought the property at 2501 Tulane Ave. for $740,000 in May. Joe’s Lawnmower Shop once occupied the location and is in the same block as the warehouse. Jeffrey Feil, CEO of the Feil Organization, plans to build either an extended-stay hotel or a mixed-use development near the $1.1 billion University Medical Center and immediately adjacent to the nearly-completed Veterans Affairs Hospital, according to a demolition request application filed with the city. The documents show two different plans for the site. 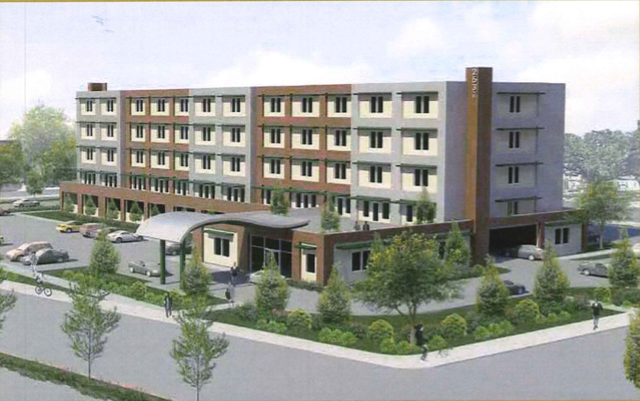 The five-story hotel would offer around 59,500 square feet of space with 88 rooms. Rooms would be located on the top four floors, and sizes would vary from 356 to 408 square feet. There would be 139 parking spaces, with 115 located off-street and the remaining to be on the street. Designs show that cars will enter the development on South Rocheblave and South Dorgenois with the main pedestrian entrance fronting Tulane Avenue. A second set of plans shows a 5-story, mixed-use development that would offer 20,000 square feet of retail space on the first floor to go along with 54 covered parking spaces for residents. There would be 40 spaces for retail customers. The second, third and fourth floors would be 35,000 square feet each and have 96 apartments at 830 square feet each. Designs show that the fifth floor would be an open-air space for residents. There would be a total of 96 parking spaces for residents. The application filed with the city indicates that PPS Contractors is handling demolition of the 49,000 square-foot warehouse. The work is valued at $200,000, according to the application, which was signed on Sept. 21. Designs show that Thibodaux-based Duplantis Design Group is the architect for the project. Representatives of the Feil Organization could not be reached for comment.